A special example of an Endurance Line damper is the yaw damper. 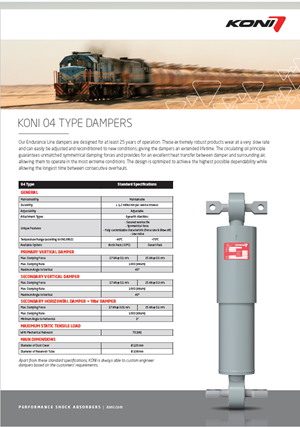 This damper is specially designed to control small-amplitude sinusoidal bogie rotational movements and thereby to enable trains to be operated at speeds above those previously possible. The same technology is also used in our inter-car dampers. » Large diameter of the piston rod limiting the surface pressure due to side loads. The direct result is reduced friction and a long life time. » High quality silent blocks. » The special synthetic rings around the piston and the guide result in the absence of any metal to metal contact. » Internal or external dust bellows, protecting the piston rod against small abrasive particles. After many years of troublefree operation, the Endurance Line dampers, due to their extremely robust construction, can be maintained and recalibrated to the level of a new damper, with limited cost. Since the damping forces can be adjusted by turning the adjustment screw with a screwdriver, normally, there is no need to dismantle the damper nor to replace internal parts. 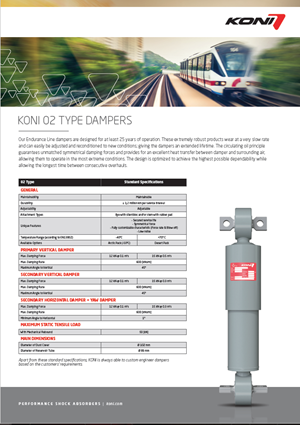 All Endurance Line dampers operate in accordance with the circulating oil principle. This means that the oil is directed through the same valve systems in the guide, during both the compression and extension stroke. On the extension stroke the non-return valve in the piston is closed and the oil above the piston is forced through the damping valves in the guide. At the same time, because of the increased volume below the piston, oil is forced through the non-return foot valve. During the compression stroke the non-return foot valve is closed and because the piston is forced down in the cylinder, oil flows through the now open non-return valve in the piston. The oil displaced by the piston rod is forced through the damping valves. 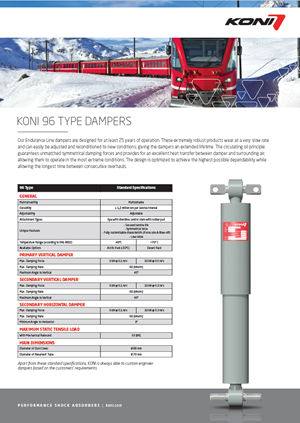 Due to the unique valve system of the Endurance Line dampers, nearly every required characteristic can be provided within an unmatched narrow tolerance band.